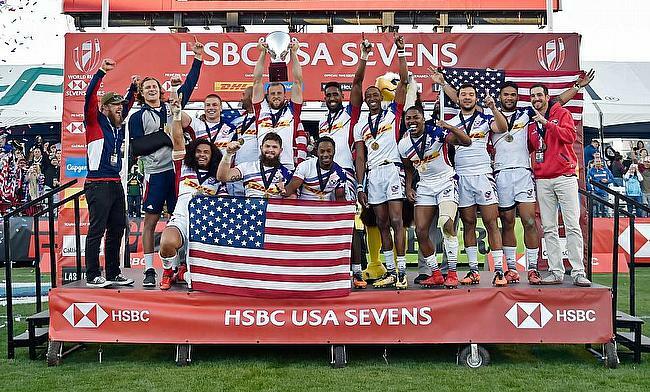 USA came up with a clinical performance to blank Argentina 28-0 in the final to clinch the Las Vegas leg of the HSBC World Rugby Sevens Series 2018. This is also USA's first series win on home soil and this is their second ever Cup final with the first coming in London Sevens in 2015. Perry Baker started the proceedings with a third-minute try and HSBC Player of the Final Danny Barrett scored back to back tries in the seventh and 10th minute. Replacement Carlin Isles, who came off the bench in the 15th minute made an impact two minutes later with the fourth try for the home side. Folau Niua converted all the four tries as USA reached 28 points, scoring 14 apiece on either half while Argentina failed to add a single point. "Credit to the men in the arena they were outstanding, they went out there and executed," said USA 7s coach Mike Friday. They’ve executed all three days but especially today we had to change tactics for the Fiji semi we then had to readjust for the Final everyone delivered and that’s great to see. This is a total squad effort and I’m lucky to have such a great bunch of players and support staff. “We want to show the sporting landscape in the USA what rugby can be and how that fits within the American landscape and this hopefully will touch and reach a lot of sports fans who realise they’ve got another national team that they can be proud of and that they can support." Earlier, USA topped Pool C after winning all the three consecutive games and defeated New Zealand 7s and Fiji 7s 14-10 and 7-19 in the quarter-final and semi-final to make it to the final. Meanwhile, Argentina, who were top of Pool D, defeated Kenya 17-12 and edged out South Africa 12-10 to set the final with USA 7s. The winner of Hamilton 7s Fiji finished third in Las Vegas 7s. France went on to win the Challenge Final with a 26-19 win over Canada in the final. South Africa continue to top the Overall Standings with 92 points and are followed by New Zealand and Fiji with 82 and 79 points respectively.